From the 15th to 31st July an exhibition „ Līvõd kuņšt” – „Livonian art” can be seen in the exhibition hall of the Latvia Ethnographic Open-Air Museum The exhibition hall is open for visitors Wednesday to Sunday 10:00-17:00. „Līvõd kuņšt” is already the third travelling exhibition of artists of Livonian origin, which this time the Livonian Culture Centre (Līvõ kultūr sidām) is organising within the frame of the program for the International Year of Livonian Language and Culture (read more on http://www.livones.net ). 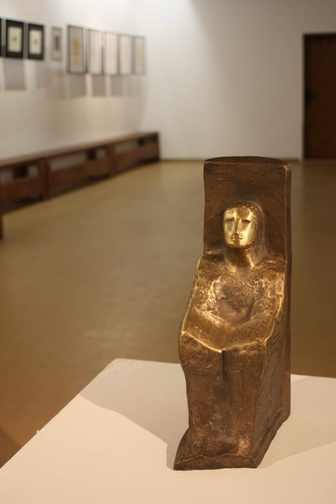 The first exhibition of the artists of Livonian origin took place in 1994 in the Livonian folk house in Mazirbe, but in September 1998 during the Livonian Culture Days in Riga the second exhibition took place. The third „Līvõd kuņšt” exhibition which is taking place this year summarises 32 works of eleven artists: oil paintings, water-colour paintings, graphic art drawings and sculptures. This summer it was already out in the Kolka Livonian Centre „Kūolka”, but after Riga it will also be exhibited in Ventspils and several cities in Estonia. It is intented that this exhibition could be a beginning for a regular exposition of Livonian art, which could find its place in Kolka. The curator of the exhibition is the graphic artist Baiba Damberga. About her etching „A coin” the artist explains: „Here I have drawn the money of the Livonian Republic for internal use. I would like to draw a portrait of a Livonian on every currency. It has so happened that I started with myself “. The exhibition also shows works of the following artists: Jānis Belte, Zelma Belte, Taira Haļapina, Valts Ernštreits, Rita Lele, Lilita Līce, Anete Ozoliņa, Andrejs Šulcs etc. Looking deeper into the works of the Livonian artists maybe one can feel the essential in the world vision of Livonians where every author with his/her creative manner and radiance of personality etches a peculiar line. Maybe it is the language of art which is becoming the form of communication, which allows the Livonian of nowadays to recognise his/her identity, and for the surrounding world, an opportunity to get to know Livonians without language barriers. The closing event of the Livonian art exhibition will take place on the 31st of July, when the Open-Air museum with an extensive celebration is going to celebrate the forty year anniversary since the Livonian peasant’s- fisherman’s homestead „Dēliņi” was transported from Lūžņa village in Ventspils region and placed in the museum. In this celebration the ethnographists of the museum will tell stories about scientific expeditions to Livonian villages, descendents of the Didriksoni family who lived in „Dēliņi” homestead in 19th century will also participate in the celebration. The event will be musically enrichened by the Livonian song ensemble “Līvlist” from the concert organisation “Ave Sol” in Riga, the Livonian song ensemble “Rāndalist” from Ventspils Culture Centre, Kolkas parish Livonian song ensemble „Laula” as well as the mixed choir “Lōja”. Article prepared with support of the Ministry of Culture.